The VEST for Shoulder Stabilization is custom made based on the measurements you provide; this product usually ships 3 - 5 business days after the order is placed. The shoulder is one of the most difficult joints to support and/or immobilize in the veterinary patient. A spica splint is often used to accomplish these goals, however, rehabilitation therapy is considerably hindered as the entire bandage must be removed and reapplied in order to perform the necessary therapy. In addition, at present there is no alternative device to support the entire length of the forelimb to include the shoulder for veterinary patients that have sustained a brachial plexus injury leaving the animal without neurologic function of the entire forelimb. In some of these cases, coaptation and rehabilitation therapy can assist in recovery but without a reasonable coaptation option, treatment and recovery is challenging. The DogLeggs’ VEST for Shoulder Stabilization provides the solution. It consists of a vest with sleeves that extend the length of the forelimbs. Padding can be strategically incorporated within the vest to provide additional support and/or compression to the shoulder. The vest and sleeves are hook compatible allowing for placement of straps anywhere on the product. The placement of the straps provides versatility allowing the use of the device for a number of objectives including limiting abduction and extension of one or both forelimbs, limiting range of motion of the shoulder, affecting elbow rotation and/or incorporation of a spica splint. The product may be used for long-term coaptation without the potential complications of the traditional spica splint or bandage method. The DogLeggs’ VEST for Shoulder Stabilization is easy to remove and reapply for rehabilitation therapy. This product is not appropriate for fracture management. A veterinary prescription is required to order this product. 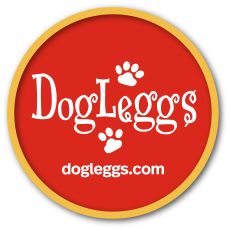 The DogLeggs' VEST and supplemental components are constructed from a lightweight material that is hook compatible. This material is highly breathable and has wicking properties. The material does not pull and the fur and is impregnated with a natural fiber that reduces odor and inhibits bacterial and fungal growth within the product. VELCRO® Brand hook and loop fasteners are used for closure and attachments. The product and supplemental components are machine washable.